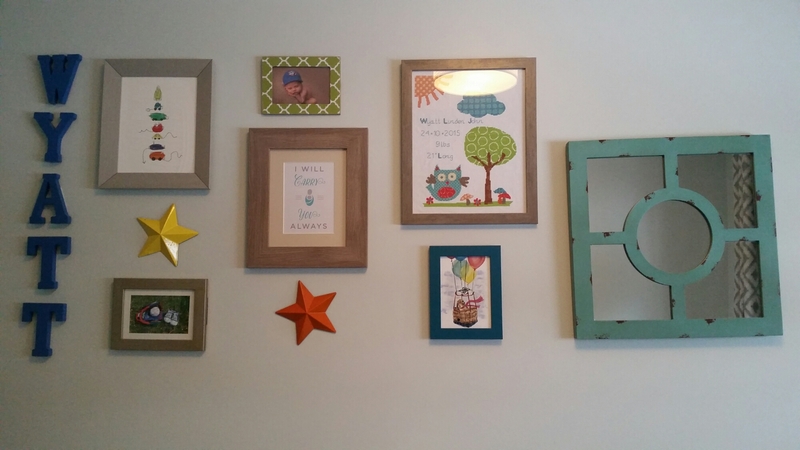 When I first set out to design out nursery, my plan was fairly open. I built a design inspiration board to get me started. I selected a variety of pieces as I found them mixing and matching to get to where we ended up. Everything in the room was new or “new to us”. We hung the blackout blinds, curtain rod and curtains. We also replaced the light fixture with an Ikea one versus one that had originally been hung when the house was built in 1979 (certain kinds of retro just aren’t cool). The gallery wall is still a work in progress. The grey frame holds an illustrated print of a variety of vehicles that I found on clearance at Chapters. It is the Owl pattern in the wood frame is a sign my Mom is cross stitching for us. I printed off a template online just to see how it would look on the wall. Obviously, she needs to wait until he is born to add his birthdate info. Yes, that means Ruby June is NOT our little man’s name. The small silver frame holds our pregnancy announcement – a photo of a Rawlings baseball and glove with October 2015 written on the baseball. The small blue frame holds a print of a chihuahua in a hot air balloon that I found on Etsy. The green frame I bought at the Dollar Store (believe it or not). It’s currently empty. 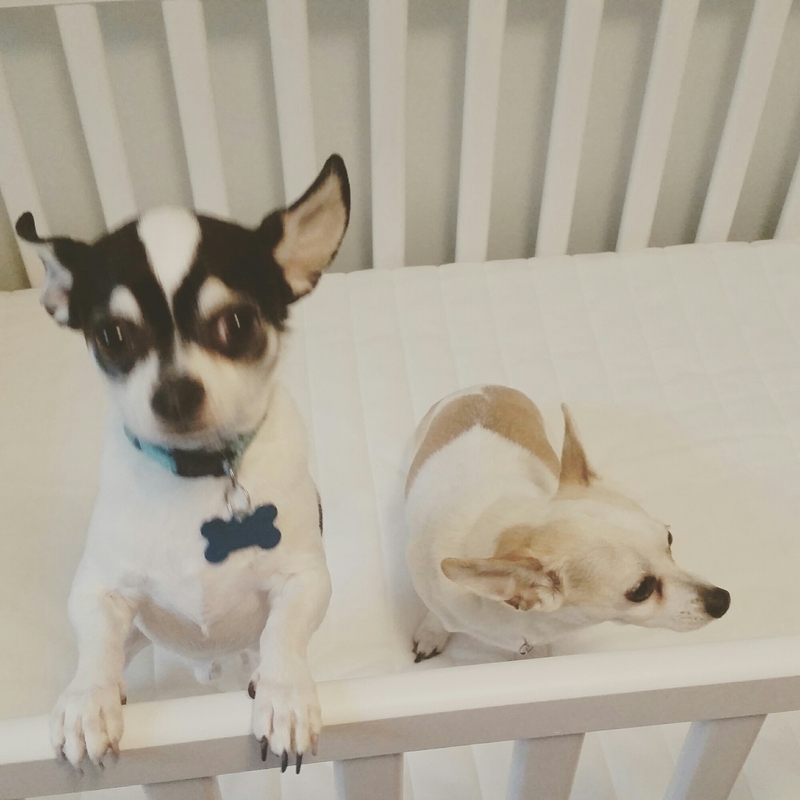 We are debating between putting a photo of the 3 fur-babies in it or one of our son’s newborn photos. The metal stars were an item from my previous home that we decided to “re-do”. They were originally green and red. My husband spray painted them orange and yellow. We hung them on the wall using sticky tack (which took me way back to the days of hanging posters in the dorm room in University). 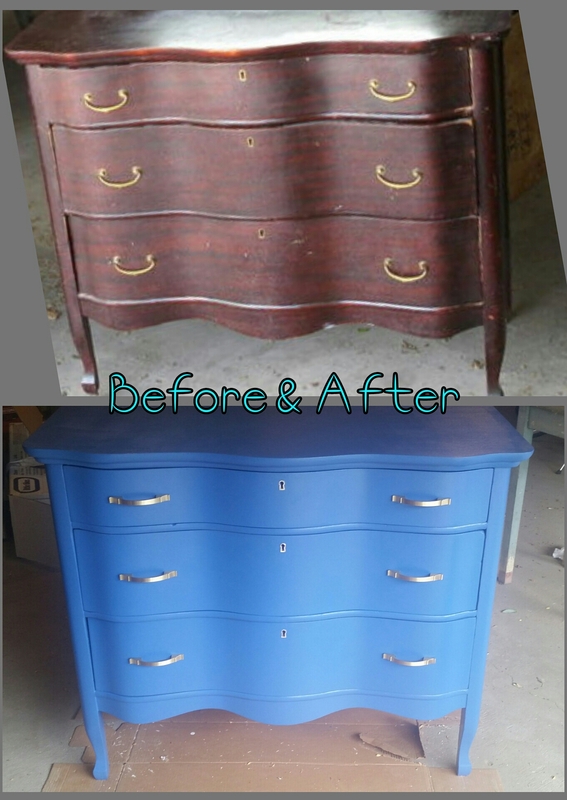 The antique dresser was another DIY project we tackled. 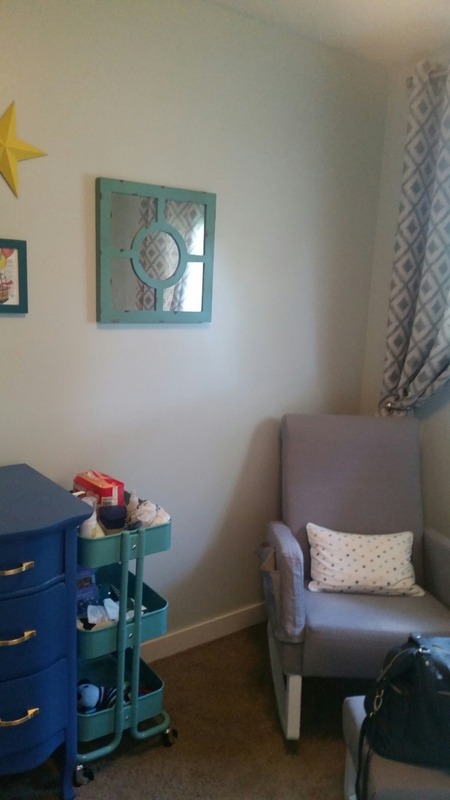 I bought the antiqued mirror at HomeSense and the rocking chair was a custom order. The pillow cover came with my bedding set from Pottery Barn, but I made the actual pillow insert for it. 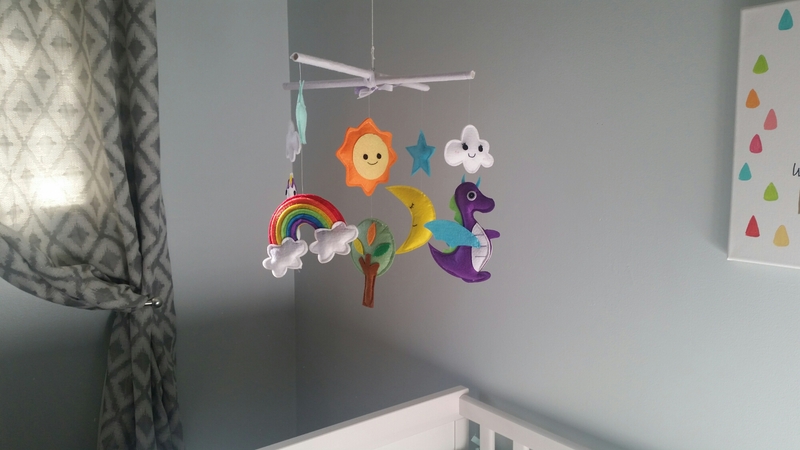 The handmade felt mobile was a custom design from lovelyfriend on Etsy. I found the ”Always be brave and wild at heart” painting at a local coffee shop. The “Follow Your Dreams” sign was another HomeSense find. 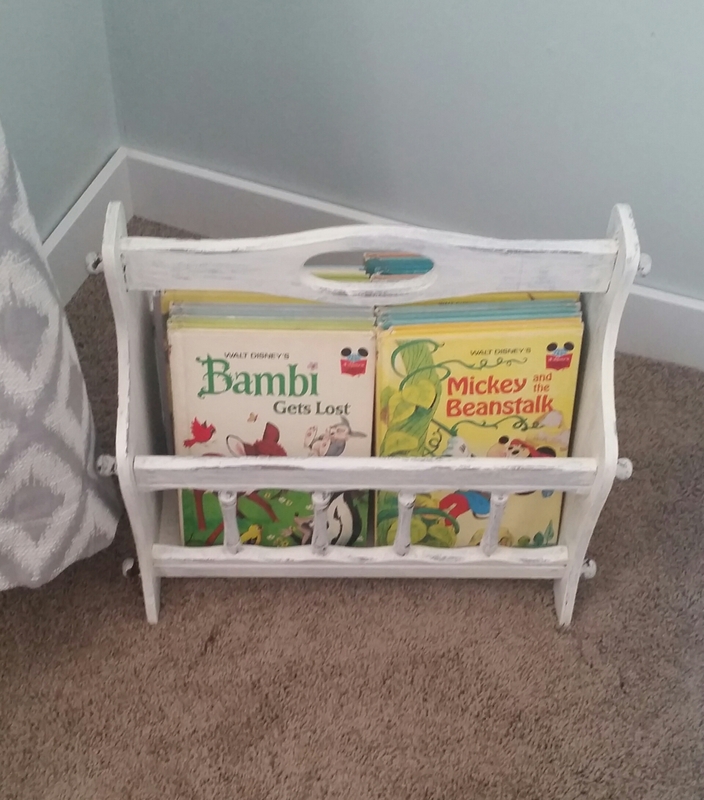 I found the magazine rack on an online classifieds site for $15. The vintage books were a gift from a friend who was looking to downsize. The collection includes a ton of classics like Jungle Book, Peter Pan, Snow White and the 7 Dwarfs, Cinderella, etc. 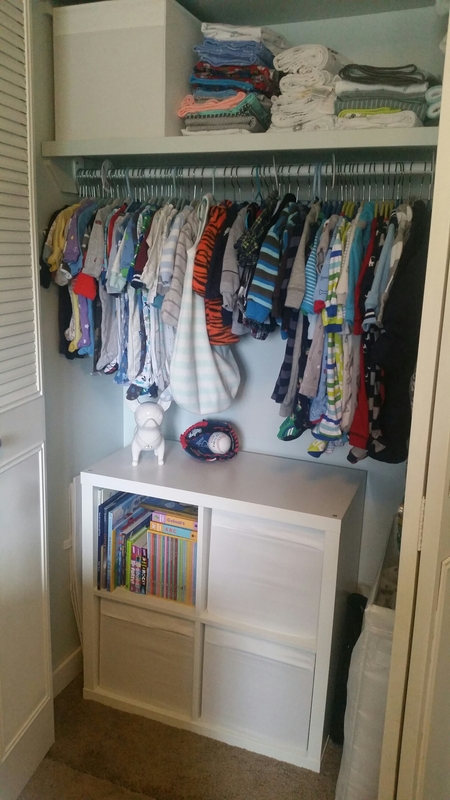 Yes, we have an abundance of clothes after buying some, receiving gifts and especially after my sister-in-law gave me my nephew’s hand-me-downs. 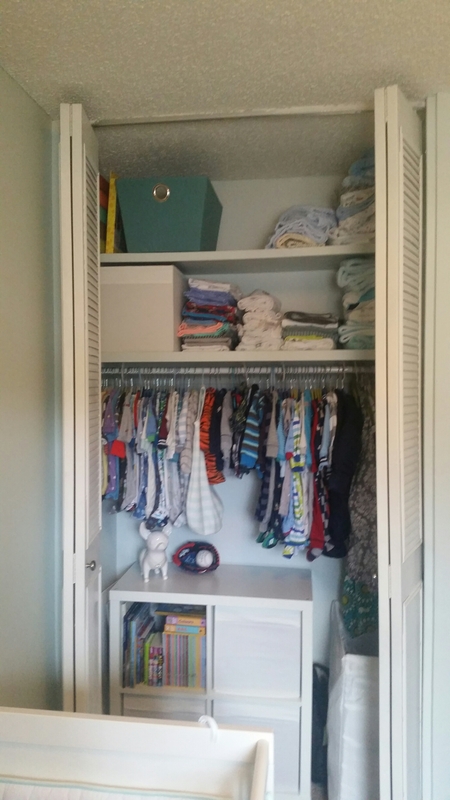 Right now, the Ikea shelf and storage containers hold our cloth diaper supplies and a few random items that we won’t need right away (like the baby monitor). My husband actually built and painted the 2nd shelf that hangs just above the bar. I love having more storage space for blankets and other items. The Ikea laundry hamper also fits nicely in the closet. The baseball-themed closet dividers were another Etsy find. I’ve got the quilt and stuffies hiding out in the crib for now. 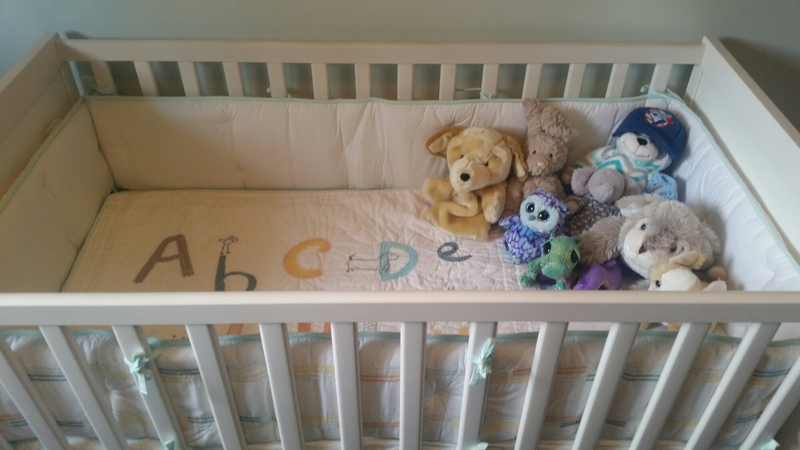 Clearly, once baby moves into his crib these items will move out. 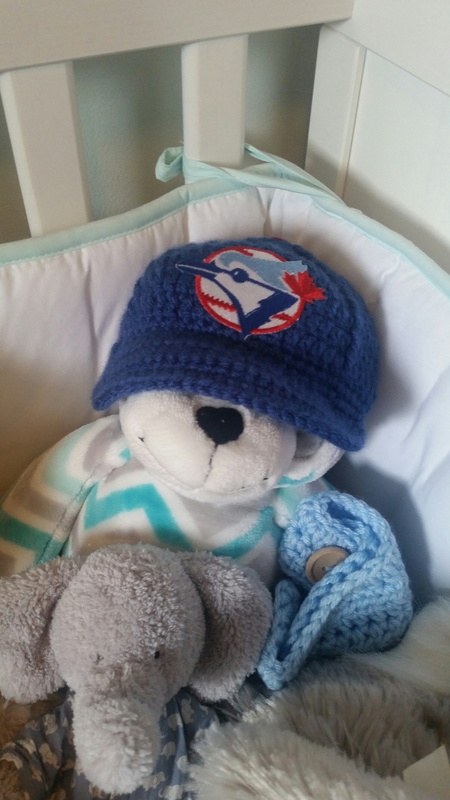 The knitted Blue Jay’s hat was a special purchase I made for my husband. 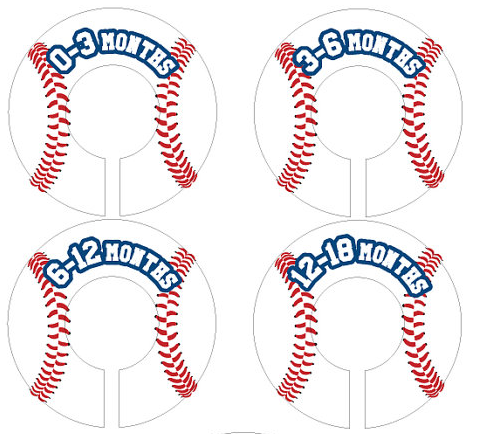 Since the Jays are on a winning streak this year, we haven’t been able to find any newborn-sized Jay’s merchandise. It’s all sold out. I found this hat on Etsy for our little guy to wear during playoffs and maybe even in a few newborn pics. I found the “Shoot for the moon even if you miss, you’ll land among the stars” sign at my friend’s crystal shop. 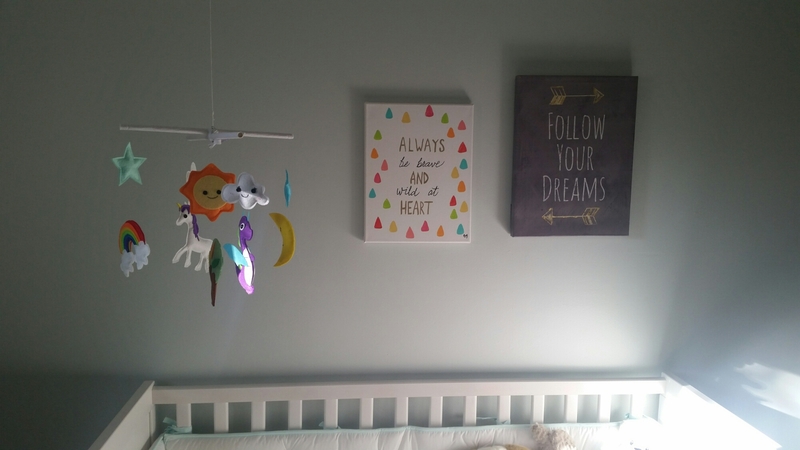 It was one of the last pieces I purchased for the nursery, but I thought it tied in nicely with the stars on the gallery wall and the mobile. My husband also swapped out the original light switch for a dimmer light. 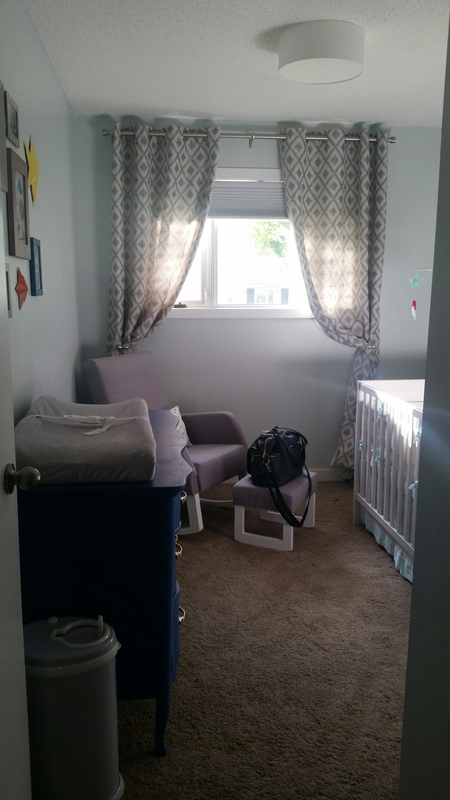 The nursery! I remember spending many late nights on Pinterest dreaming of the day that I would finally be able to plan my baby’s nursery. The good news is: this effort wasn’t wasted. 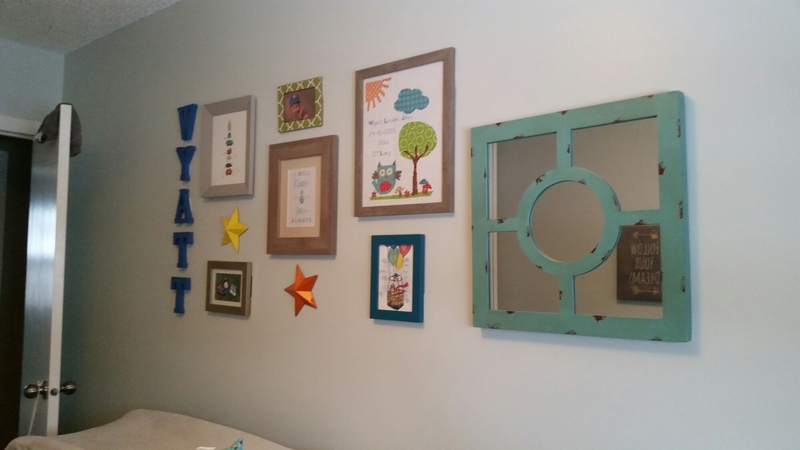 When the time came to design our little man’s bedroom, I turned to my Pinterest boards for inspiration. Three years ago, we painted, replaced the carpet, and trim in all of our bedrooms. 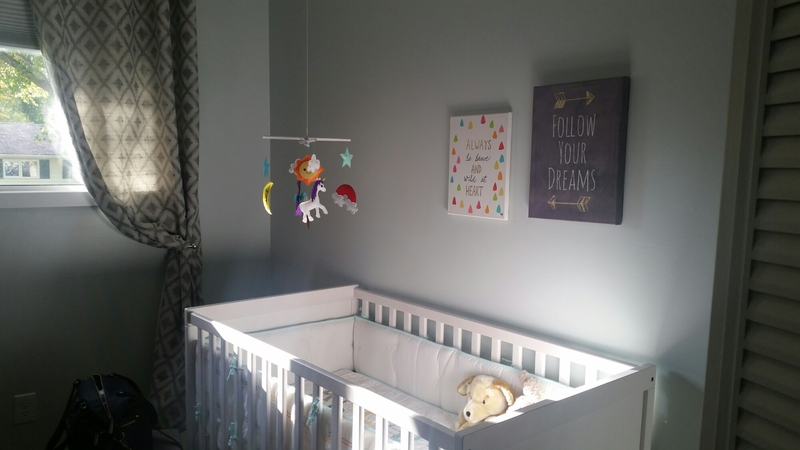 For the baby room, we chose the colour “Morning Fog” by Martha Stewart. This paint line is actually discontinued now. It’s a good thing I saved a swatch because we needed to buy more to touch up. 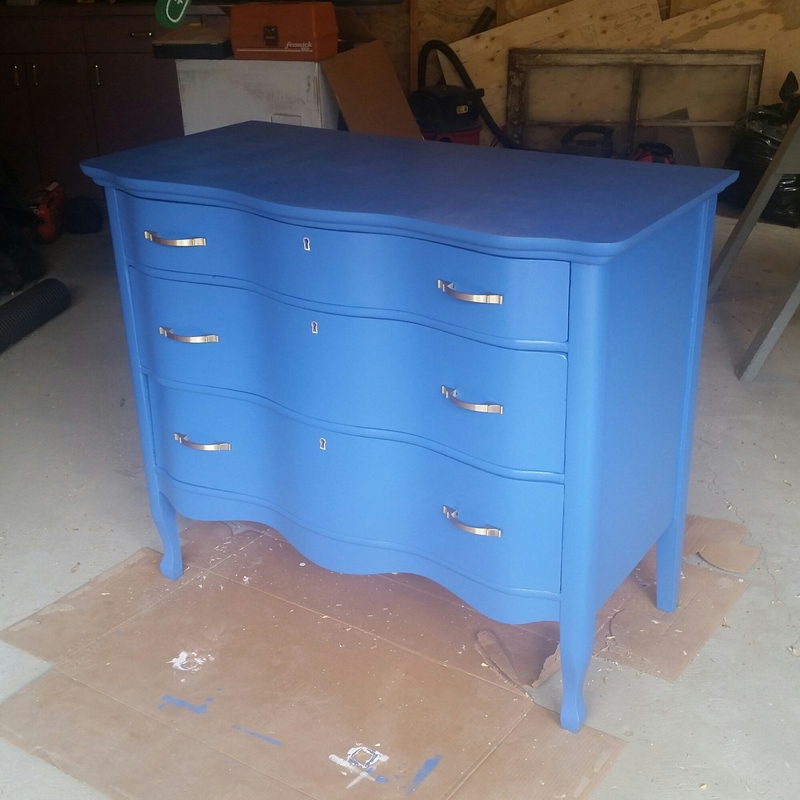 The second blue colour we chose was “National Anthem” by Behr for our antique dresser and a few other accents. As we selected furniture and decor items for the room, I put together this inspiration board to see how my pieces would work together. I created this mood board using http://www.gomoodboard.com. 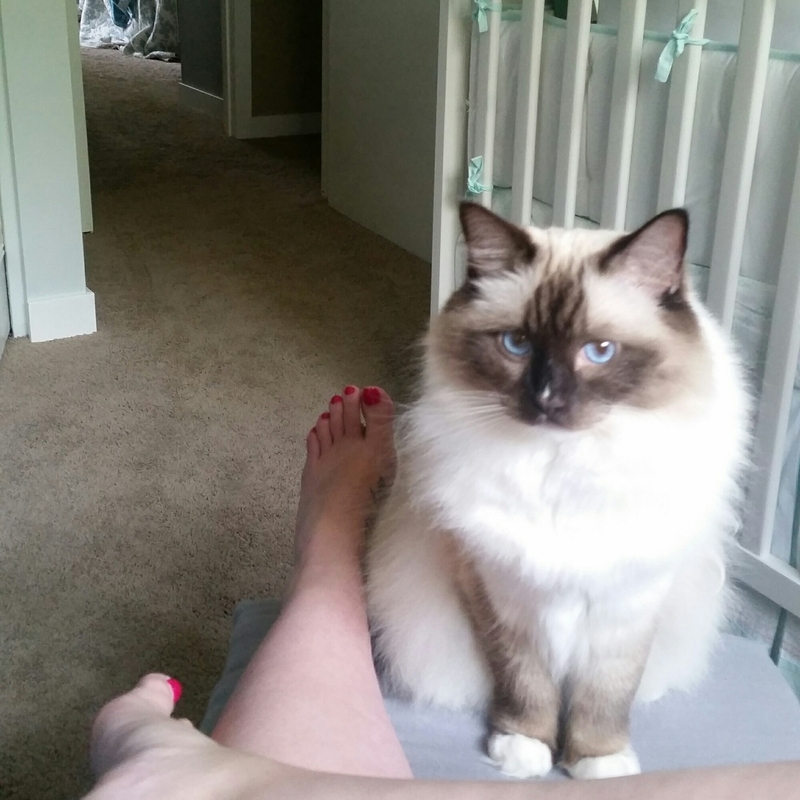 This post is a preview to the actual unveiling of our nursey. Stay tuned for that post tomorrow! The rocking chair has arrived! 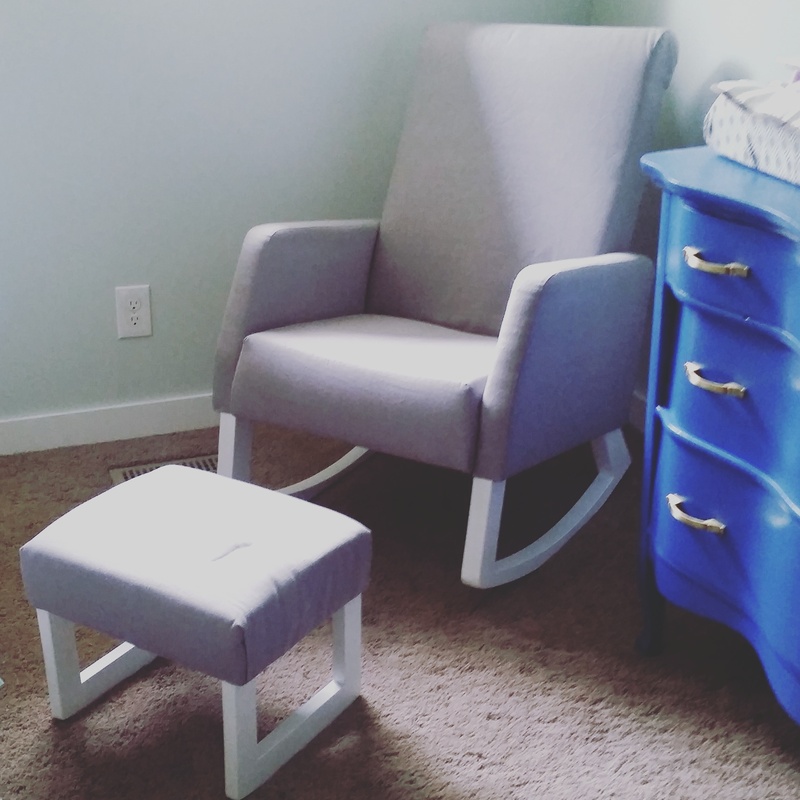 I’ve been waiting to receive our rocker for 28 days… Doesn’t seem like long compared to everything else we’ve waited for, but the wait was hard when it’s a critical piece for finishing the nursery! 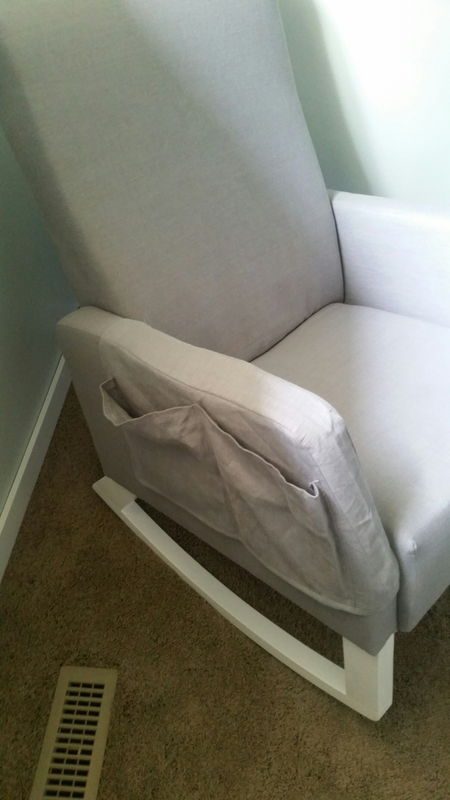 I ordered the Poplar Naptime Rocker in Grey Linen from a custom Canadian furniture company called Off Your Rocker. I also ordered the Mum’s Helper which is a matching slipover sleeve with pockets to hold items while you are rocking. Our nursery is not a very large room. I thought this accessory would save me having to find a side table to go with the chair. The owner/craftsman Frank has excellent customer service. He kept me in the loop throughout the building process to let me know where he was at. It took 3 days to ship from Ontario to Saskatchewan. Assembly was super easy. The chair itself came in 4 pieces and the ottoman came in 3. All bolts and an Allan key were supplied. I will get my husband to tighten everything – just to be sure – once he gets home, but most people should be able to handle it themselves. 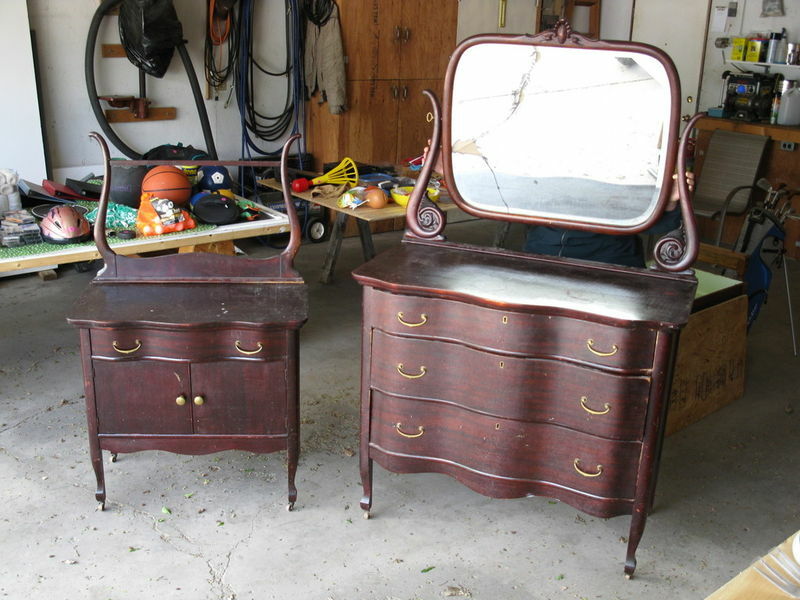 I purchased this antique dresser and washstand two summers ago (you know back when we still thought getting pregnant would be easy). 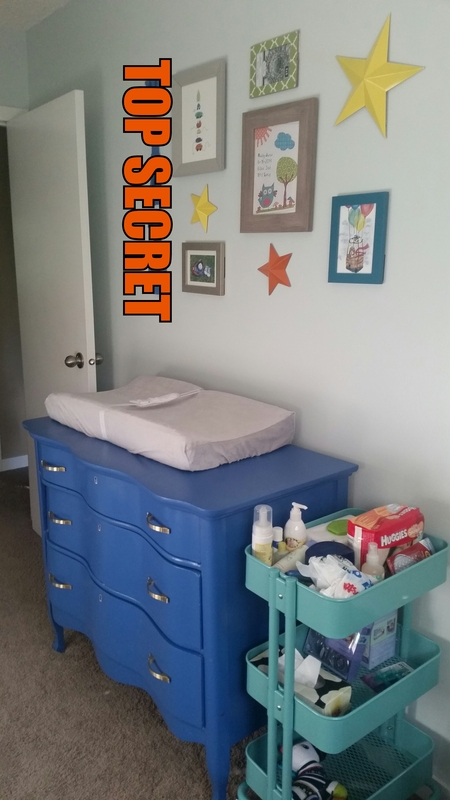 We paid a local gal to refinish the washstand for our living room, but decided to DIY the dresser to save on cost and add our love into the project. Last summer, I removed the mirror, wheels and handles. Then, I stripped and sanded it. Now, it was finally time to finish it for our baby boy’s room. As recommended by our friendly Home Depot paint specialist, we used two coats of stain blocking primer, followed by two coats of Behr Marquee Paint. We thought that we might get away with one coat of paint, but the imperfect finish of the dresser required more coverage. We ended up using 3/4 of a quart. After much deliberation, we chose the colour National Anthem by Behr. Whenever we have a paint colour choice to make, we hang swatches on the wall in multiple locations (i.e. bright spot, dark corner). We take a few days to view the colour(s) in multiple lighting scenarios (i.e. cloudy, sunny, early morning, late evening, artificial light). 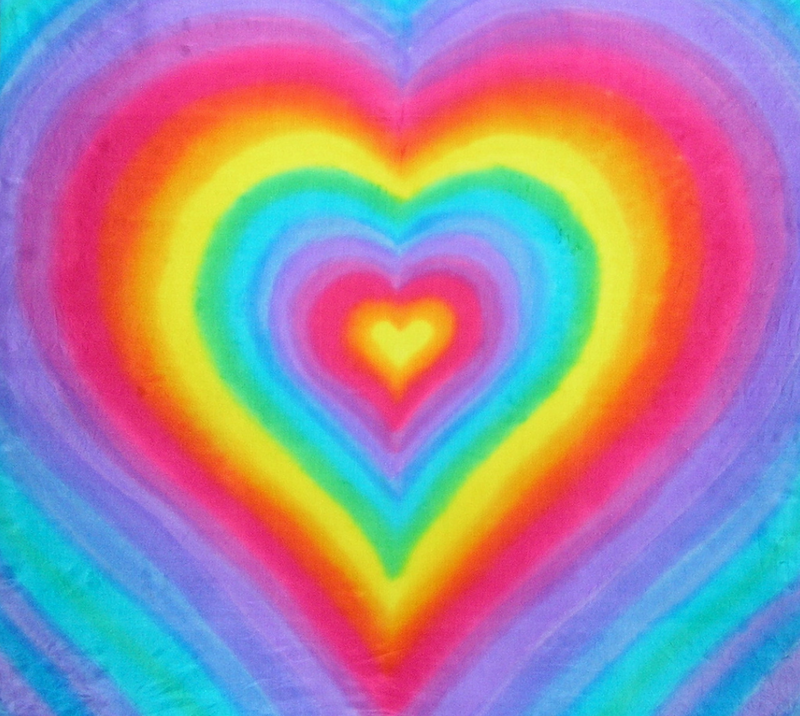 When we first started out, we had a rainbow of colours on the wall; although, I was leaning toward a dark purple or navy. I was surprised as our elimination process lead us to such a gender typical blue. In the end, I absolutely love it! We purchased new gold handles from Home Depot to accent the gold key holes. 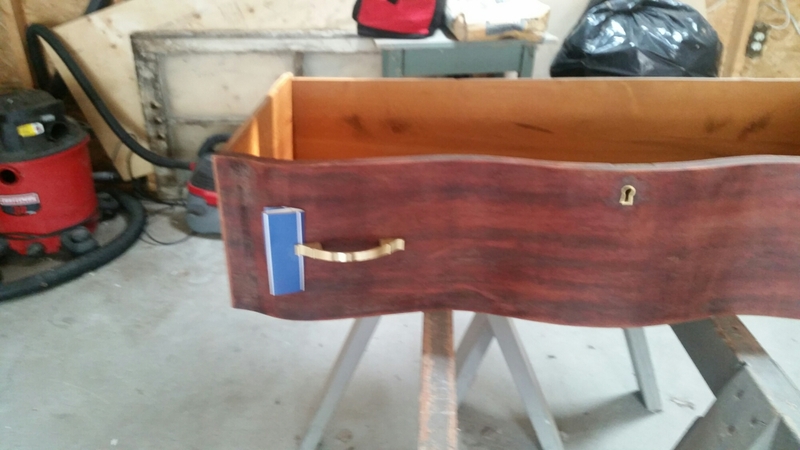 My husband also did an excellent job of fixing the drawers so they glide smoother. Today, we started priming the antique dresser we are painting blue for the nursery and we put together our crib! 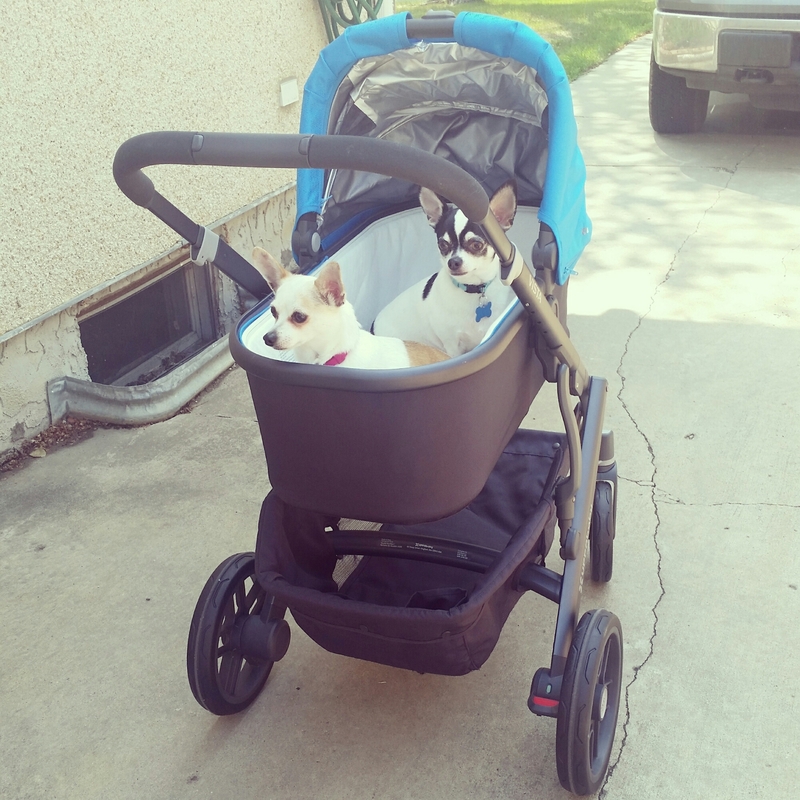 Nothing makes me giggle more than enjoying the new human baby items with my fur-babies. 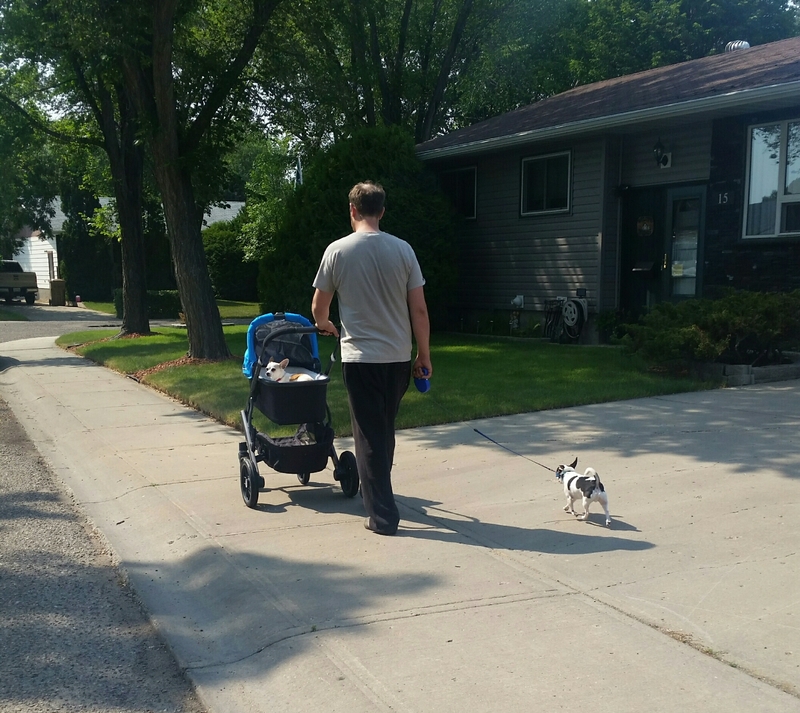 I also convinced my husband to let me take them around the block in our Uppababy stroller with the bassinet on. I’m currently 25 weeks, 2 days pregnant. I’m feeling a bit overwhelmed these days – especially because I’m tired and can’t get as much done. It’s like I want more time to get things done, yet I also want time to hurry up so we can meet our little man.